As you already know (Oracle Coherence Integration and ADF BC Programmatic VO) - Oracle Coherence can be integrated relatively easy into ADF BC and can help to improve ADF BC runtime performance for cached data. This is true, but it was interesting to do a quick research and check in practice - how much optimization Coherence caching gives for ADF BC application. I was using fairly simple application (ADFCoherenceApp_v2.zip) from my previous Coherence post (mentioned above). This application comes with two exactly same screens - one is based on regular SQL View Object, another is based on programmatic Coherence enabled View Object. I was running identical JMeter stress test for both screens. This shows - to retrieve data from Coherence cache is faster comparing to retrieving the same data from DB with SQL. Sample application is fairly basic, but the same tendency will be reflected in production enterprise systems. Of course we can't use Coherence for every use case, but for such use cases where fast data access is required - Coherence will be great help. Below I show you samples from the stress test. 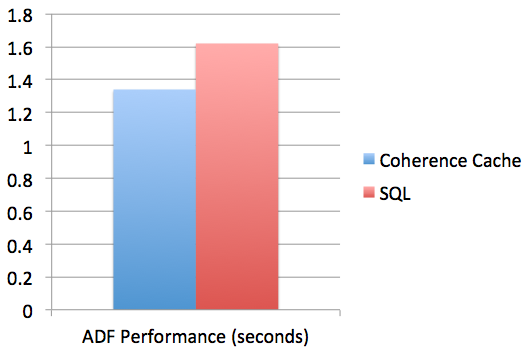 Lessons learned: runtime performance is much faster when using programmatic VO as a wrapper to access data from Coherence cache, comparing to POJO bean (Data Access Optimization in ADF with Oracle Coherence) acting as a wrapper to access Coherence cache. 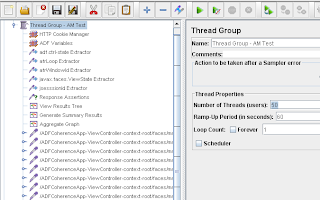 This seems because ADF BC Data Control runtime performance is faster comparing to POJO Data Control performance - this is on my list to verify with another JMeter stress test. I think there is a problem with your graph. The time axis starts at 1.2, but it would look better if it started at 1.3 instead. I have changed it to be from 0, this is better. I am trying to migrate your example to JDeveloper 12.1.3 but have run into problems with the database connection. It appears to be looking for a connection named HRDSDS and fails because it can't find it. I am trying to run the application in the SOA Suite version of JDeveloper 12.1.3 Quick Start on the integrated WLS server. I have looked through the source code and can't find any references to HRDSDS. Do you have any ideas? 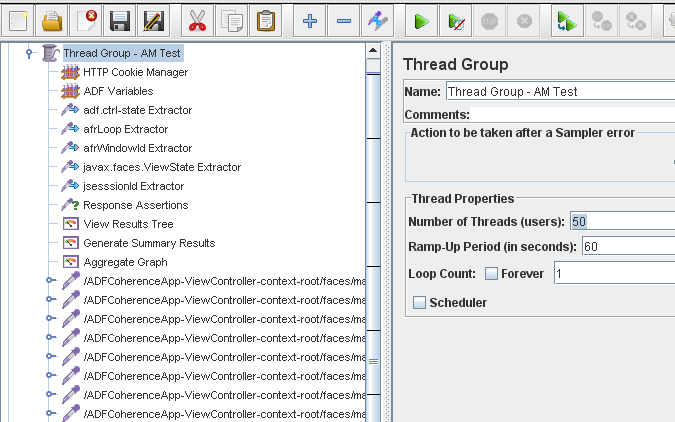 ADF BC in this sample is using HR schema, you must define jdbc/HrDSD data source in WLS to make it work.